Healthy Loser Gal: Halfway up the mountain! Gift of Fitness Challenge: Week 7 Check-in! Halfway up the mountain! Gift of Fitness Challenge: Week 7 Check-in! 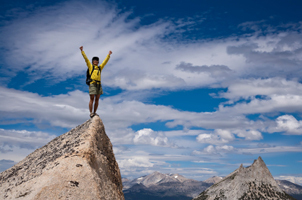 Have you ever gone rock or mountain climbing and you get halfway up to the peak and you look down? And you stop a moment and think to yourself "Oh, I have climbed halfway, that is really great... I didn't think I would get this far. Look down there at the base... 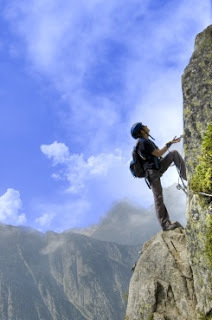 I could climb down now and still be satisfied... and safe because I know I'll get down there without any difficulties." Or you can keep climbing up! You can dig in your heels and plant your feet and reach for your goals and CLIMB to the top... go for the finish... especially when the end is in site. Does it get easier in the second half of a journey? Not always. You may have trained yourself and conditioned yourself during the first half to expect certain obstacles and overcome them. But, in my experience, there is always something new that will pop up to challenge you, to allow you to test yourself and feel that thrill of reaching a once out-of-site goal. Let's do this! Let's finish the rest of this challenge strong and on target. Remember to write down your goals... revise them if you feel that will help you... believe in yourself... journal your activities and food daily... plan your meals and snacks and exercise... don't waiver from your belief in your own abilities and CELEBRATE every single achievement, large or small. Every ounce of energy you put into this challenge of fitness and health will come back to you in unmeasurable ways. You may see 'measurable' results on the scale or the tape measure or in besting personal fitness goals, but you can't see the internal pride you'll feel by keeping promises to yourself. Check-in here for WEEK 7 through the comments... I want to hear your accomplishments and challenges and will be rewarding those of you climbing, stretching, challenging yourself to reach your own goals!